What about eye caps?? As mine has one and can't seem to get it off for nothing. I have tried a few tricks but still nothing. I tried soaking and then a q tip. I have tried soaking then scotch tape and it seems like it is stuck in the eye socket?? Any suggestions? He is about to shed again soon will this one come off with the new one?? Brian from Snakebytes recommended using one of those rubber thumbs to gently wipe them off. I'd soak first and then try that. But to clarify are you sure it's a retained eyecap and not a dented (dehydrated) eyecap? Sometimes if the humidity is too low the eyecap will look wrinkled and it's a hydration problem and not a retained eyecap. I did this and it works. 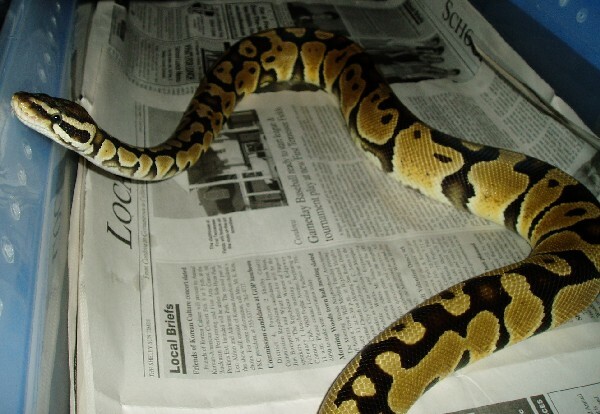 However, we all know how head shy BP's can be and mines no different. That's the only place that the shed didn't come off. Any suggestions to get the skin off of his head? Head shy or not, I just gently rub off any shed the same as I would any other place. Sometimes it's just a bit harder and takes a bit more determination. Brian from BHB had a great tip of using a 'rubber thumb' to help get off any extra shed. 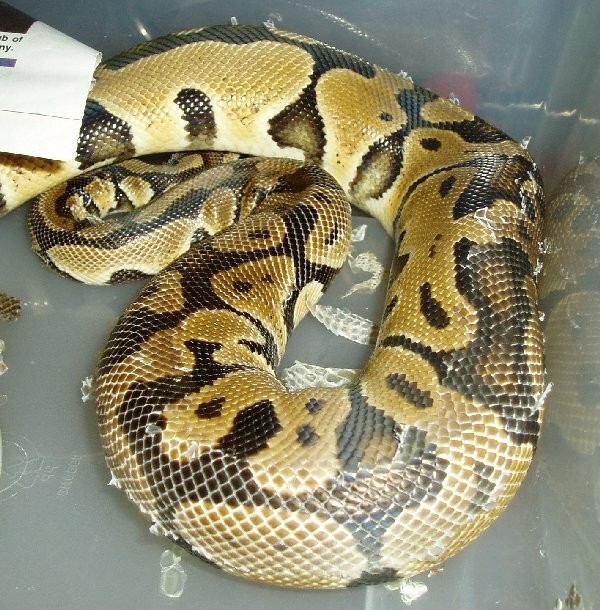 If it's not covering the eye and is only just a small bit of retained shed, you could always wait and see if it comes off with the next shed as well. Wow - what a Godsend this thread is. 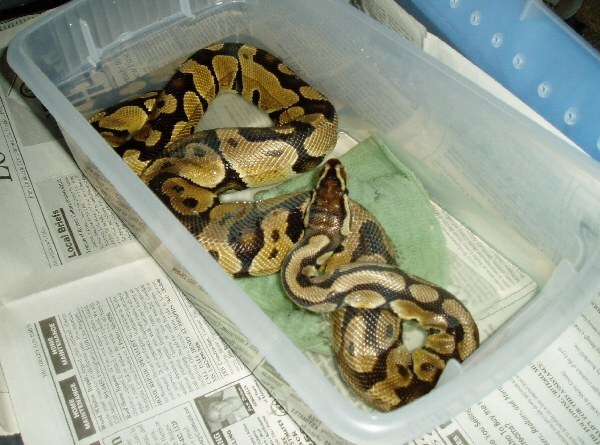 Here I am... first BP... second shed. First shed he did like a champ. This one ... nope. He had blue eyes last thursday. I've been waiting and waiting for the shed. This morning I found his head piece (with both eye caps in it - thank heaven for something good). Shed hanging off at his neck. He's not able to get it started. I can see him trying - his little hide a hut is moving and moving all over the tank with him in it. But his little head right above where the shed is stuck is getting duller and duller - like he's just rubbing and rubbing to get it going and can't. There's a few bits and pieces on the ground along with lots of what look to be 'single' scales. My question is.. do I really need to wait 24 hours before giving him help? 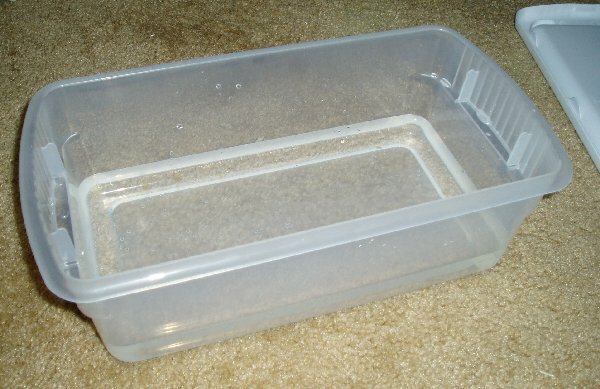 Or would it be OK to set up a soak box this afternoon and help him along? 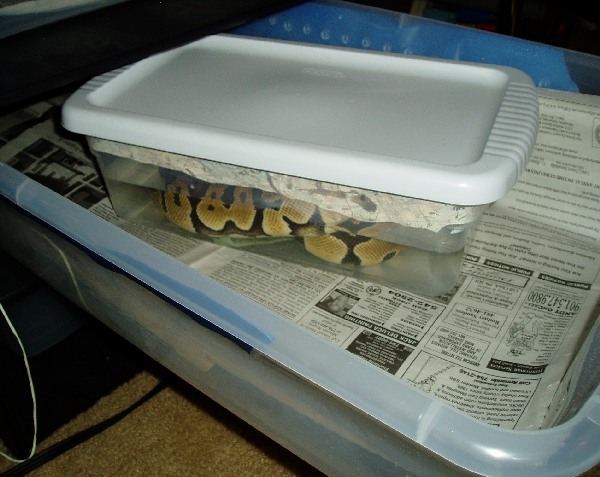 If he is still trying to remove it you could try helping him a bit by giving him (and his enclosure) a light misting. You don't want to go so far that it is wet or anything just a light spray to see if it helps loosen the edge up for him. Thanks for the tip. 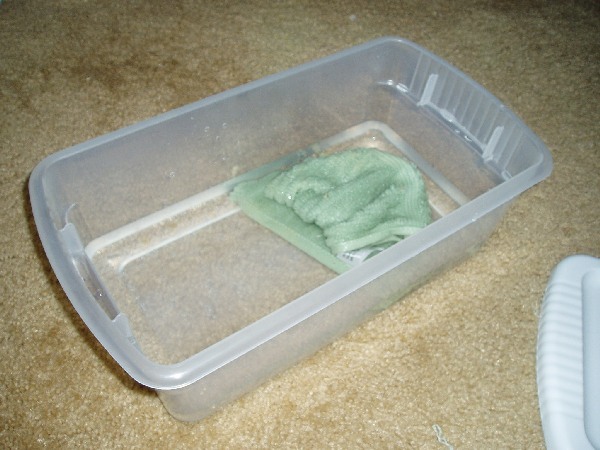 I tried that for him and he still seemed to be struggling, so I did the whole soak box and washcloth. Needed my Staples 'Easy' button when I was done with that. 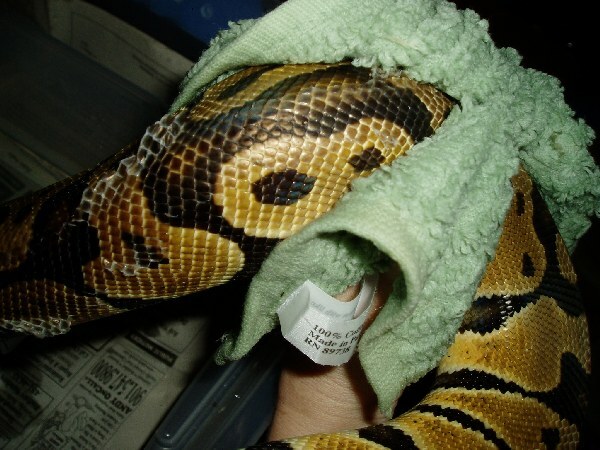 He slithered right thru the washcloth in my hand and everything came off like a charm.